Graphics Software for ambitious coaches, chief coaches, authors, teachers, presenters. WINDOWS VERSION. Second license easy animation for MAC. 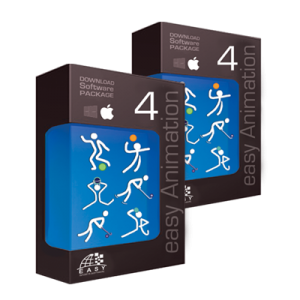 If you also want to work with easy Animation 4 on your second computer. Graphics Software for ambitious coaches, chief coaches, authors, teachers, presenters. Easily create professional sports graphics with easy Sports-Graphics. Use the graphics in your training sessions, soccer books, websites, screen presentations, magazines. Soccer, Handball, Volleyball and Hockey in 1 version. You can use the same tool that is used by Bundesliga clubs, DFB/US Soocer/NSCAA and other Federations and European academies and coaches from grassroots to professional clubs. scalable screen, multiple selection, Copy & Paste etc. Many Bundesliga Clubs, the DFB and other Coaches Associations are using easy Sports-Graphics 7 pro (for MAC and WIN). Lots of Coaches and Coaching Directors all over the world designer drills and tactical analyses with this graphics software. To get the software started on Mac you need PARALLELS or BOOTCAMP.